Dorner’s flexible chain conveyor platform, SmartFlex®, is now available in an 85 mm width standard option. With this addition, SmartFlex Conveyors are now available in 4 standard widths: 65 mm (2.6”), 85 mm (3.3”), 105 mm (4.1”) and 150 mm (5.9”). Other sizes that can be specially ordered include: 45 mm (1.8”), 180 mm (7.1”) and 260 mm (10.2”). This new expanded offering gives customers greater options for various applications in packaging, food, medical, assembly and other industries. SmartFlex Conveyors are engineered to exact customer specifications and shipped in sub-assemblies for fast and easy installation. 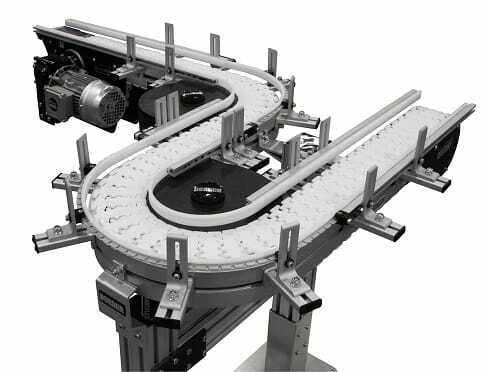 Using Dorner’s Online Configurator D-Tools, users can design and engineer simple or complex conveyors to meet their needs in minutes. The industry-leading tool delivers a complete 3D CAD assembly model for instant validation of fit. One of the many strengths of the SmartFlex Conveyor is product transfers. Accessories such as infeed and exit powered transfers allow for smooth end transfers for products as small as 3” diameter. SmartFlex Conveyors are engineered to seamlessly integrate with Dorner’s other 2200 Series low profile belt conveyor platforms, an advantage that gives customers the ability to select Dorner for all its mainline and support conveyor systems. For additional flexibility to move product up or down and around equipment, the SmartFlex Helical Curve, Spiral, and Alpine conveyors are the answer. The SmartFlex Helical Curve allows incline or decline movement through corners and straights, and provides capability for vertical incline with minimal space. The SmartFlex Spiral is capable of twisting 360° degree turns to move product vertically with an extremely small footprint. Both the helical and spiral conveyors feature a patent pending chain design that allows the conveyor to maintain speeds and loads through the angled curve. The SmartFlex Alpine is designed for long, continuous incline or decline runs with tight turns. It’s also ideal for accumulating, buffering and cooling product between processes or machines. Dorner’s December 2015 acquisition of Malaysia-based FlexMove, a leading manufacturer of flexible chain conveyors for the food, beverage, automotive, electronic and other industries, is helping drive new innovation in the SmartFlex line by offering customers expanded conveyor options and capabilities.